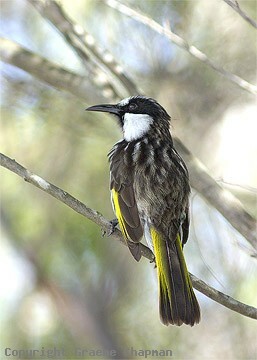 White-cheeked Honeyeaters are traditionally associated with the banksia-rich heathlands of the east coast from near Bermagui in NSW north to about Rockhampton. Further north in Qld they occur further inland, often at higher altitudes in forested areas as far north as the Windsor Tableland. 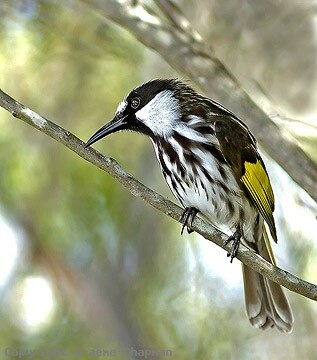 In Western Australia, a distinct subspecies lives in the south-west in the dryer sub-coastal forested shrublands between Israelite Bay and Geraldton. 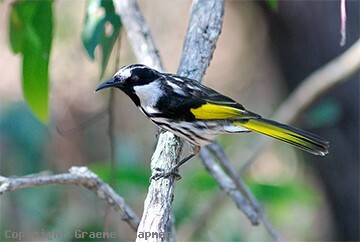 White-cheeked Honeyeaters nest in dense shrubbery not far off the ground and in good seasons may be in sight of their neighbours in scattered colonies. 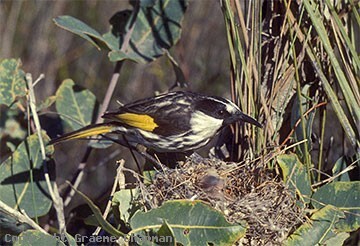 Around Australia, nesting has been recorded in every month of the year but along the east coast tends to peak to coincide with the flowering of the banksias in late winter. White-cheeks do not form large flocks but post breeding they wander in search of food, mostly in small groups and often together with New-Holland Honeyeaters, their close associates. There is at least one record of these two species forming a mixed breeding pair.